Ever wondered what the real truth behind distilled water is? Myths exist and this makes things harder for one to distinguish fact from fiction. We believe that it is essential for customers to understand the logistics behind distilled water and the way that they see it. Normal tap water is put through a process of distillation. This process removes nearly 100% of contaminants and impurities from the water leaving you with pure H2O. The aim of the distillation process is to purify the water. The process of distillation involves water being evaporated into steam, which is then caught and placing it in another container. This leaves being all impurities in one and only converts pure h20 into the other. Distilled water can be used in a number of industry and laboratory environments for cleaning, rinsing and testing. It is also used commercially in irons, vehicle batteries, auto cooling systems as well as aquariums. Distilled water is a multi-purpose water product that is suitable for both industrial and home uses. Can I drink distilled water? There is split decision on this question and the debate in ongoing. As a company, we do not recommend it for human consumption. Distilled water can only be used in medical fields? No, distilled water can be used for aquariums, ironing, for lead-acid batteries, and water cooling systems for computers as well as other commercial uses. Can I make my own distilled water? 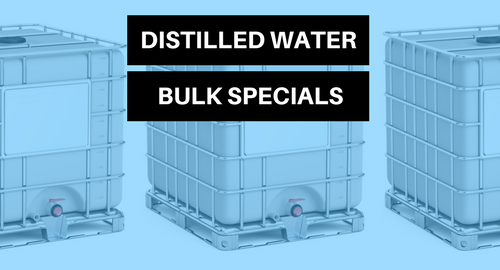 Yes, you can use trusted home distillers to produce high quality distilled water at an incredibly economic rate. If you would like to purchase water from The Distilled Water Company, please do not hesitate to call us on 0330 123 3309 or email us at contact@thedistilledwatercompany.com. One of our specialists will gladly assist you.